Some bittersweet news for Killjoys fans. According to The Hollywood Reporter, Syfy has renewed the TV show for two final seasons. The sci-fi drama follows a trio of fun-loving, hard-living interplanetary bounty hunters who are sworn to remain impartial as they chase deadly warrants across the Quad — a distant system on the brink of a bloody, multi-planetary class war. 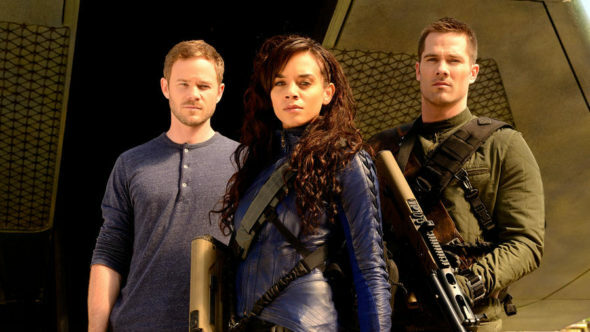 The cast includes Aaron Ashmore, Luke Macfarlane, and Hannah John-Kamen. Syfy has ordered 10 episodes each for season four and five, which will be the final two seasons for Killjoys. The season three finale debuts tonight, September 1st, at 8 p.m. ET/PT. What do you think? Do you watch Killjoys? Are you glad the series will get two more seasons? I’m glad it’s continuing for 2 more seasons. It’s an awesome show and I think it should go on. We need to clean up the universe and the killjoys are the ones cor the job. The stories could be endless. Like the show. Glad they aren’t cutting it off prematurely like they have with other shows… Maybe they could do a crossover and bring the Dark Matter cast into this universe. That’d be kind of fun. I started watching this show late and binge watched the first two seasons then the third. This is by far my favorite show on tv. We really enjoy this program and am glad to see that it will continue for 2 more seasons and have a proper ending. We are extremely unhappy that SyFy didn’t do the same thing with Dark Matter; a program we felt was equally good. I don’t understand their reasoning by doing this and it leaves a very poor impression of SyFy’s management. glad it’s continuing, but killing Dark Matter is an effing joke. I agree fully with this comment!!! Love this show and am so excited that we’re gonna have an ending to a show. Five seasons is perfect. Any more might see the story lines degrade, then get cancelled and we end on a cliffhanger. Enjoyed Dark Matter too, but not as much as Killjoys! I glad to see the Syfy is allow us to have a proper completion to this series. I really enjoy it. Too many science fiction series have ended with questions unanswered, which really detracts from the whole genre. I’m glad it’s extended 2 more seasons. Love the series so far. Not as good as Dark Matter! Glad to see that it’s continuing. That we know there will be 2 more seasons is good news. Afterall all shows, with the possible exception of Supernatural, must end sometime. This is a fantastic show and I look forward to seeing where it will go next. The only thing that would make the two season renewal even better would be if each season was 20 episodes long. Great news that we get two more seasons to round off this very entertaining sci fi show. I have enjoyed each episode. The cast and writing have been excellent, I wish the show could go on for even longer.